Crab season has begun in the Pacific Northwest and we’re relishing all the fresh, sweet Dungeness crab we’re plucking from Puget Sound. This twist on a classic gazpacho recipe is the perfect light dinner on a hot summer evening. It’s refreshingly cool and full of bright and beautiful vegetables. 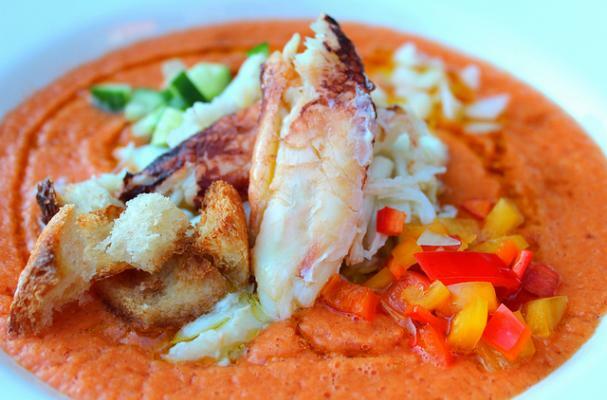 The addition of crab in this healthy chilled soup recipe simply makes this dish all the more drool-worthy. 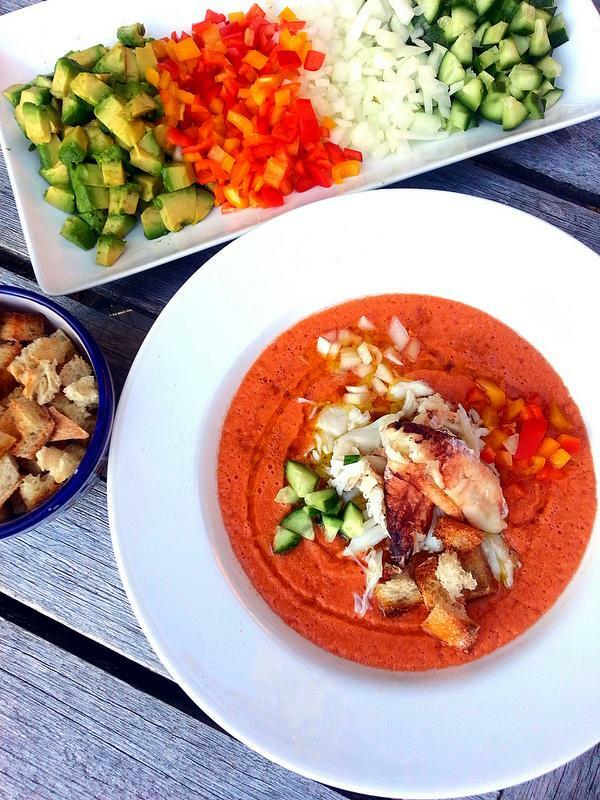 A traditional Spanish gazpacho uses only the pulp of the tomato, thus requiring you to remove both skin and seeds. In our easier version we used flavorful and meaty heirloom tomatoes, which contain fewer seeds than other varieties, so we skipped this step. Remove stems from tomatoes. With a sharp paring knife, score an X on the bottoms of each. Place in a large pot, fill with water to cover, and bring to a boil. Cook until the skins begin to roll back: about 3-4 minutes once boiling. Remove tomatoes with a slotted spoon and place in a large bowl; set aside and allow to chill. Once tomatoes are cold enough to handle, remove the skins. Return tomatoes to the bowl and place in the refrigerator until chilled; at least 1 hour. While tomatoes are chilling prepare the garnishes and arrange on a plate (as shown) or in separate bowls. Remove tomatoes from refrigerator and place them, along with all their juices, in a large blender or food processor (you may need to do this in batches depending on the capacity of your blender/processor). Add the vinegar, salt, and bread and process until smooth. If you like a thinner version, slowly add cold water. Divide soup among bowls. Gently place a pile of crab in the center of each bowl. Drizzle with olive oil, garnish with veggies and croutons (or let guests do the garnishing), and serve. let guests drizzle their own sherry vinegar as some like their gazpacho more tangy than others!